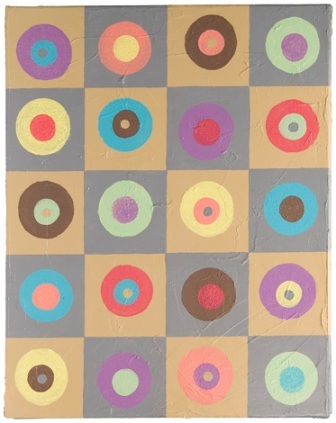 You can easily create a 70s-inspired Mod canvas with circles of color and great texture. This is a great idea for DIY wall decor. Use palette knife to apply light coat of Texture Stucco to canvas in haphazard pattern; let dry. Use foam brush and Antique White to paint over Texture Stucco and let dry. Use ruler and pencil to mark canvas off into 4" sections. Use flat brush and Slate Grey to paint alternate squares. Let dry. Dip cosmetic sponge separately into Pineapple; Antique White; Mississippi Mud; Peony Pink; Wild Orchid; Melon; Pistachio Mint; and Bahama Blue and press on center of each square section, twisting sponge in place to improve stamped shape. Repeat process, placing colors as desired and let dry. Referring to photo for placement of colors, use 1 1/4" pouncer dipped into paint to dot center of each large circle; let dry. On random squares, use Slate Grey and Antique White to stamp small dots at centers of some dots. Let dry. Spray with Americana Gloss Spray and let dry.